Luxury Vinyl Flooring | Swansea, ILWe have a new 800 number, but you can still call us at 618-234-2915 if you prefer. Collins Flooring America is your source for attentive service and leading-edge luxury vinyl flooring in Swansea, IL. Our extensive selection can leave many customers feeling overwhelmed, so we provide you with personalized assistance at every step of the process. We consider the entire home when we recommend a series of flooring options that fit your approach to life. While laminate flooring is an excellent choice for high-traffic areas, vinyl is a smarter approach for rooms that experience higher levels of moisture. Our flooring store carries an extensive selection of vinyl tiles and planks that feature an advanced photo wear layer that gives the appearance of traditional hardwood, slate, and stone. Find the vinyl floors you need when you browse our extensive selection. You are sure to find the products you need, from the manufacturers you trust. Ask about our 5 Star Selection System that helps the customer get the products and protections they need for their interior. Start transforming any ordinary bathroom or kitchen into a place you won’t soon forget. Combine the character of traditional hardwood and the endurance of vinyl into one functional flooring product. Sit down with a flooring specialist that has the experience needed to identify the right combination of flooring products. Creating a new look for a home starts with great flooring, and our store offers products from leading names like Spotlight Values and Downs H2O. Our customers want a floor that looks great while being easy to clean. Many feel as though they have to sacrifice style for performance when it comes to flooring for the kitchen and bathroom. Luxury vinyl in the hands of an experienced installation specialist provides you with the performance you need and the style you desire. Choose a professional that is focused on your satisfaction. An installation specialist can inspect the subfloor to identify any damage to the subfloor that must be repaired. 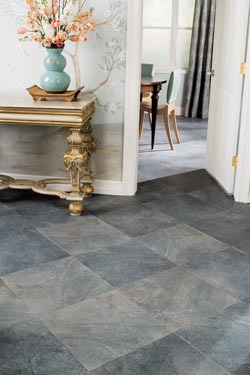 Luxury vinyl tile is resistant to moisture, fading, and spills. With the right approach to sealing and care, your new floor will be easier to clean. Choose a luxury vinyl plank product that fits your unique environment, and streamline the installation process. Newer floors are the right move whenever you are putting a home on the market for sale. Your location will become a destination when you create a new home interior that features resilient flooring. Contact us to start identifying the luxury vinyl flooring you need to improve the value and beauty of your home. We proudly serve customers in Swansea, Belleville, Fairview Heights, Waterloo, Collinsville, Illinois, and the surrounding communities.